Gran Hotel Son Net is an old finca dating from 1672, with a beautiful patio. It has been restored several times to date, the final restoration ending in June 1998. Natural stone flagged floors and ancient rustic beams are combined with the elegance and traditional interior designed public areas and Guestrooms. Not to forget, of course, the impressive centenary oil press which makes a Gourmet Restaurant, L´Orangerie. In 1229, when the Christians reconquered Mallorca, the area of Son Net and its surroundings were given to the Bishop of Barcelona, one of the most influential people during that period. The property of Son Net was one of the largest in Mallorca and was called Pariatge. Son Net was divided into different sections called El Palmer, La Granada, Conques, Calprida and Ortolutx. These were given as rewards to some the most important knights of the Christian Reconquest of the island. One of these knights came from the Net family. In 1453 the finca was given the name of Son Net for the first time. During this period, Son Net was the heart of Puigpunyent, with the family living on the property and the peasants and servants living in the village at the bottom of the hill. The actual shape and size of the manor house dates back to 1672. When the last member of the Net family died in 1863, the finca was divided into 27 smaller properties, of which Son Net itself is still one of the largest, with its impressive position offering magnificent views and tranquillity. 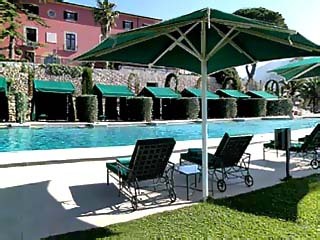 Gran Hotel Son Net is located on a small hill overlooking the Mallorcan village of Puigpunyent. In the middle of the Tramuntana mountain range at the foot of the beautiful Galatzó mountain, Gran Hotel Son Net enjoys a unique position in the southwest corner of Mallorca. In the evening, the sunset illuminates the Galatzó mountain with a dazzling range of different colours and shades. Gran Hotel Son Net has a total of 24 Rooms & Suites, each baptized with a name from Mallorcan History. All Rooms feature the luxurious standards of a five star Hotel. They are individually decorated, each Room in a different colour combination and comfortably and elegantly equipped. 4 Standard Double Rooms on the ground floor. 7 Superior Double Rooms on the first floor. 5 Deluxe Double Rooms on the second floor overlooking the village and the Swimming Pool. 2 Grand Suites have an exclusive location in two corners of the finca, with large windows and huge Living Rooms with superb views over the magnificent countryside. 3 Royal Suites are spacious private Terraces or Gardens, beautiful views, huge luxurious marble Bathrooms, Walk-in Showers, Jacuzzis and much more. The Bar Son Net: The Bar Son Net lounges have a large range of art and antique furniture, a cosy fire-place, views to the patio and the valley of Puigpunyent. Don´t forget to ask for the superb cocktails masterly prepared by our Barman, combined with the music for the occasion. In the summer, the bar also includes open air terraces. Tea time: is served every day in our fire-place lounge from 16.00 until 18.00 from the 15th of October until the 15th of April. Twelve different types of tea, scones, muffins, plum cakes, fruit cakes and finger sandwiches make it a complete feast.